Maybe the biggest storyline of the day, outside of McCown and Garrett’s first NFL play going down as a sack, was the removal of rookie QB DeShone Kizer after a scoreless first half. Second-year QB Kevin Hogan came in after the halftime break and led the Browns on two scoring drives. While Hogan may have impressed, the Browns ultimately fell short in the 17-14 Jets victory. With that, we give you our PFF exclusive takeaways from the contest for each team. While he managed just four yards after the catch, Seferian-Jenkins was the most reliable receiver for the Jets today with six catches and a touchdown off eight targets. Every reception came against a different Browns defender, but the longest went for just nine yards, and he earned a total of just 29 receiving yards on the day. The Jets struggled with Cleveland’s blitz scheme, and gave up a large number of unblocked pressures off protection busts. A good number of them came via the A gap, thus it’s not a surprise to see Johnson was charged with five of the seven pressures assigned to the Jets’ offensive line. Davis was very productive from his linebacker spot. Davis finished with three stops in run defense and an impressive three QB hits rushing the passer. Claiborne was tested often with 13 passes thrown to his coverage. Claiborne yielded seven receptions for 84 yards but he also had an interception and some pass breakups in coverage to get the Browns offense off the field. Johnson finished with 2.17 average yards after contact and finished with an elusive rating of 55.0 and averaged an impressive 3.17 yards per route run coming out of the backfield. Johnson gave the Browns life in the fourth quarter taking a routine screen pass 41 yards for a touchdown. Hogan impressed in relief duty finishing 15-of-18 for 185 yards with two touchdowns and an interception. Hogan completed 2 of his 3 deep passing targets (20 yards or more) that he attempted. McCourty surrendered five receptions on seven throws into his coverage, but the long completion went for just six yards to Jermaine Kearse. He also intercepted an out cut thrown slightly behind Robbie Anderson on the sideline, and broke up another throw late that was intended for Austin Seferian-Jenkins. 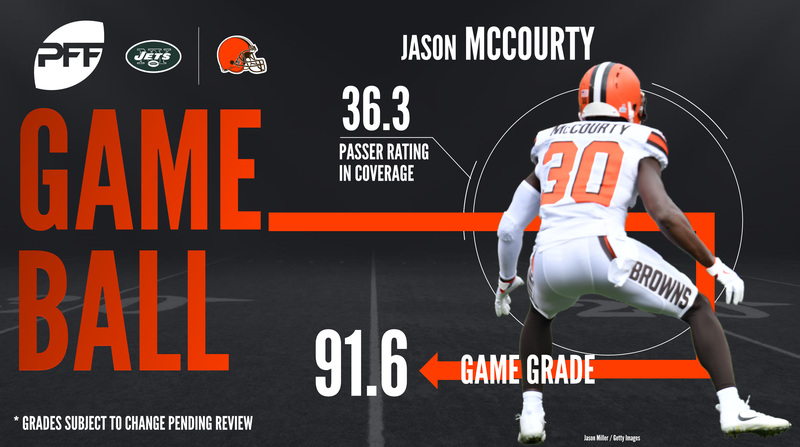 Jets QB Josh McCown had a passer rating of just 36.3 when throwing into McCourty’s coverage on the day. Garrett’s career got off to a fast start, as he tallied a sack on the first drive of the game after a missed pickup by the Jets’ offensive line, and posted a second one later cleaning up on a McCown scramble. Otherwise, he was ineffective in the rest of his 16 snaps, as he posted a run defense grade of just 45.2 and made no other impact on the pass-rush.